Laparoscopic surgery and enhanced recovery after surgery (ERAS) programs were two major improvements for the management of colorectal diseases. The purpose of this systemic review was to examine whether laparoscopic colorectal surgery still improved short-term postoperative outcomes in comparison with open surgery when both groups of patients received ERAS programs. PubMed, Embase, the Cochrane Central Register of Controlled Trials, and reference lists of the identified studies were searched to identify randomized clinical trials that compared laparoscopic with open surgery in patients undergoing colorectal resection in the context of ERAS programs. The outcome measures were analyzed, and the quality of evidence for each outcome was assessed using the Grading of Recommendations Assessment, Development, and Evaluation (GRADE) system. Five randomized clinical trials encompassing 598 patients were included in the final analysis. Two of them were multicenter trials. The ERAS programs implemented in the five included trials cannot be classified as optimal ERAS programs, but suboptimal ERAS programs. Laparoscopic colorectal surgery significantly reduced total hospital stay (weighted mean difference (WMD) −1.92 days; 95 % confidence interval (CI) −2.61–−1.23 days; P < 0.00001) and number of complications (relative risk (RR) 0.78; 95 % CI 0.66–0.94; P = 0.007) compared with open surgery in the setting of ERAS programs. No significant differences were found between groups for primary hospital stay, number of patients with complications, readmission rates, and mortality. The quality of evidence for all outcomes was low-to-moderate on the GRADE scale, and none had high quality. 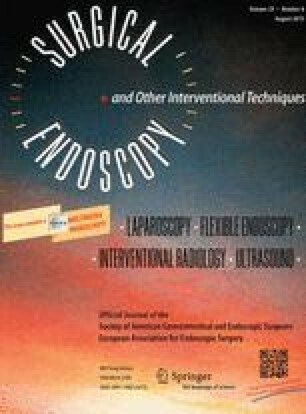 Laparoscopic colorectal resection significantly reduced total hospital stay and number of complications when compared with open surgery in the setting of suboptimal ERAS programs, but the benefits of laparoscopic colorectal resection remain to be proved within optimal ERAS programs. Cheng-Le Zhuang and Dong-Dong Huang contributed equally to this work. This study was supported by the clinical nutriology of medical supporting discipline of Zhejiang Province (No. 11-ZC24). Drs. Cheng-Le Zhuang, Dong-Dong Huang, Fan-Feng Chen, Chong-Jun Zhou, Bei-Shi Zheng, Bi-Cheng Chen, Xian Shen and Zhen Yu have no conflicts of interest or financial ties to disclose.